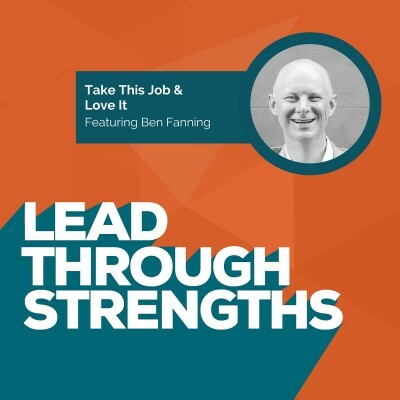 Ben Fanning shows you how to take the job you’re already in and shape it into something you’ll love. He says to think twice before quitting your job. He cautions you to look carefully before you fire a team member. Why? Well, it’s because both actions can cost as much as buying a new car. That’s a lot of money! And often, the role can be tweaked in a way that brings your talents (or theirs) to the forefront. You’ll find this episode especially useful if you’re not in your “dream” job. Even if you are – things change – and you need to know how to steer those changes toward work you can truly enjoy and thrive in. Books: both the StrengthsFinder 2.0 book and The Quit Alternative. Tips: Ben’s ideas and examples will help you make the best choices for your personal career and your company’s productivity. Since we’re expanding our StrengthsFinder team in Austin, Texas and around the world, this interview was helpful for us too. It reminds us to match each team member to work they are energized by. I can say from personal experience that this feels like magic when it is done well. Seriously. I get giddy several times per week when I see how well matched we are for certain responsibilities. My position as Director of Client Experience at Lead Through Strengths is a perfect partnership for Lisa and me. While she run the delivery side, I run the operations side. I get to curate articles using my Input talent. I combine my Achiever and Responsibility to be sure that every project step happens accurately and as promised. And we’re even re-matching talents as we speak as it relates to podcast duties. Ben’s tips were hitting home for both of us as we recapped the show. Start journaling. Writing in a journal helps you notice how you really feel about your job. And look, Ben is not a touchy-feely woo-woo guy if you’re thinking that journaling is for the soft. He’s a practical guy who wants outcomes—and journaling gave him a huge shift. Make it yours. Continually molding yourself to the job erodes your personal mold and you forget who you are. Ask – Why am I working in the first place? Knowing the answer to this question can help you during the tough times. Ask – What are the work activities I’m doing that I truly enjoy? Ben calls these items “soul-filling” work. He points out the more you fill your day with these things, the happier you will be. And as you might guess, the happier everyone else will be too (cough cough, ahem, I think Ben’s wife will agree based on the sticky note she left him). TIP: To figure out what you enjoy doing, pull out your calendar and circle the things you are really looking forward to doing. Look at the conversations you have, and think about what you’re saying. Look at the trends. Stop advertising the tasks you do well, but don’t enjoy. Why get type cast into a character you despise? Lets say you are great at cleaning toilets. You think it’s gross, and you hate every second of this duty. Would you put it on your resume? No. Surely you wouldn’t. Yet this happens every day because people are in the habit of listing a skill inventory. Start mentioning the things you really enjoy. Tell your manager. Put them on your resume. Add them on LinkedIn. And bring them up in conversations with teammates. Ask clients and teammates to send you comments about things you’ve done well (that you enjoy), and then show those to your boss. After showing these good reviews, ask for the task to be added to your job description. You’ll be surprised at how often you can change your “official” responsibilities if you take on projects that you love—especially when you figure out how to tie that to business outcomes. Listen for the business challenges your company is facing, and find ways to solve those issues. Solve these problems using the activities you love. This way, you’re helping the company while making yourself happier. When you’re feeling stressed or you’re thinking about quitting your job, remember that you can improve your existing job. With some effort, you can shape it into what you want it to be. So go claim your talents, and share them with the world! Ben has made it easy for you to get even more tips to improve your current job. Click here to go to his website, benfanning.com, where you can also grab a free copy of his report, The Catastrophic Cost of Quitting: How Organizations and Employees Pay the Price. Click here to purchase The Quit Alternative on Amazon.com. Other ways to connect with Ben are Twitter, Google Plus, Facebook, and LinkedIn. Ben mentions he was motivated by Simon Sinek’s work, The Golden Circle, which is available for free by clicking here. Lisa Cummings: [00:00:04] I’m your host, Lisa Cummings, and I’ve gotta tell you, whether you’re leading a team, or leading yourself, it’s hard to find something more energizing and productive than using your natural talents every day at work. [00:00:15] Today, you’re going to love this guest. If you think your job is just, “Bleh,” or if you dread your commute, or if you beat your alarm clock a little too hard when you pound on the snooze button every morning, if you just feel bored and apathetic at work, today’s guest will help you change all of that. [00:00:33] His advice about not quitting your job inspired today’s theme song. Do you remember that old one from Johnny Paycheck “Take This Job and Shove It?” There are also a couple of versions by the Dead Kennedys and David Allan Coe. Well, today’s guest will tweak those lyrics for you. Ben Fanning: [00:00:57] Whoo. Thanks, Lisa. Heck of an introduction. I did not know that the Dead Kennedys had a version of that song. I’m making a note and I will check that out immediately following our interview. Lisa Cummings: [00:01:15] [laughs] So, Ben, I invited you to this show after reading your book The Quit Alternative and I just love how you help people create and reshape their work inside of their existing job without having to quit. Now, before the audience hears how to recreate their job, I want to know how this all came to be. What drove you to figure it out? Ben Fanning: [00:01:38] Yeah, Lisa, I’ll be happy to share that here. I grew up with big dreams with a corner office. I really envisioned myself in a big city in this office surrounded by glass and having that moment where I’ve gotten on my personal jet as a CEO, I flew back to my hometown in Alexander City, Alabama, and they would actually name a road after me, right? I had this big vision of that. [00:02:01] And so four different cities, four companies, four different jobs, I finally ended up in Manhattan and so I always was sort of taking the job for the next promotion opportunity. But once I had the job in Manhattan, in a corner office, it wasn’t what I thought it was going to be. The hours were longer than ever, there was more pressure and stress, and every night I would find myself coming home feeling totally exhausted, drained, burned out, and just unloading all these complaints about work and my boss and my clients on my wife. And she was just sort of my sounding board, and I think it was starting to drive her a little nuts. [00:03:15] And he said, “Ben, you need to learn to relax a little bit, and take some time and learn to laugh a little bit too.” Now, I was like, “This does not qualify as medical advice,” and I just walked out, never return to that office. And, honestly, things didn’t get much better, Lisa, after that. But my wife, in her intuitiveness, one day I woke up and she had left a Post-It note on my bag that had the name of a therapist and a phone number, and an appointment time, proactively set an appointment with a therapist. [00:03:48] Now, I don’t know how many of your listeners are from the southeast and are male, but if you’re a Southern male, the idea of a therapist is pretty close to the enjoyment of maybe being stung by a thousand bees. So it’s not a very fun experience. I was like, “Thank, God, it wasn’t a Dear John Post-It note,” you know. It’s like, “Okay, this is a little help that she’s just trying to reach out and give me here.” I actually went to that appointment, and I would trudge from our place on 86th Street in the Upper West Side uptown and I would go see this therapist once a week. [00:04:21] And, Lisa, I would walk in there and the guy would just sit there, he barely said anything. He would just listen to me, and I would just rant and just complain at this guy about how bad work was, and I actually would walk out feeling pretty good. I would feel a little bit better when I walked in but as soon as I walked in the office I just felt sort of pulled back in to this mire and this dread and just really this resentment and anger, and then still feeling exhausted at the end of the day. Lisa Cummings: [00:06:09] Oh, yeah. Ben Fanning: [00:06:11] That the problem, ultimately, started with me and so I had to make some personal changes and start thinking through this. So I started journaling, and one of the things that came out of that when I was working through The Quit Alternative, I was going back to my notes, and I discovered this note that I had written to myself back in college. Like, if I was to talk to Ben before he got his career started, what would that tidbit of advice have been? And it’s this, “Dear Ben, your job is to create the job you love.” That’s the whole thing. Ben Fanning: [00:06:47] When I left college it was all about finding a job. And this mindset of finding is actually a really big distraction because you’re fitting yourself into the job out there. So you’re sort of molding yourself to the job. Once you mold yourself enough, you start to lose yourself in your career and your job, and so it’s a really important thing to, just as this podcast says, really understand what your strengths are, understand the work that doesn’t feel like work for you. If your listeners doesn’t know what that is we can talk more about that and maybe get more into that. [00:07:25] But it’s important to know that everyone has work that doesn’t feel like work. And whatever that is for you is a direction that you want to start steering your career, and using that is really the backbone of creating the job you love right where you are. Otherwise, you’re just going to be playing the lottery as to what work ends up getting on your plate. Ben Fanning: [00:08:02] “And things have changed.” And the usefulness of this creating perspective is you expect that, right? You expect the environment to change, you will get a new boss, but if you’re always in this mindset of creating the job you love, you’re always going to be fine tuning your work activities, negotiating on your own behalf, campaigning for the work you love, just start to bringing it back to sort of net neutral in a positive-career direction for yourself that feels authentic. Lisa Cummings: [00:08:32] I really love the personal accountability in it because no matter the business situations that change around you, if you’re always shaping your career toward your strengths you’re going to feel more energized and engaged with your work. So let’s say someone’s listening to the show, Ben, and they’re digging this idea you have, yet it feels like a farfetched idea to them. Say it seems like too big of a ship to turn the way their career is going today. How do you break this down? How do you start taking action? Ben Fanning: [00:09:03] I like to think about sort of the Simon Sinek approach starting with why in the first place. So I usually just try to ask the question, “Well, why are you working in the first place?” That can really reveal a lot of powerful insights for people. Probably the most important thing that I find is when you’re burning the candle on both ends, or you’re really stressed out, it is so helpful to have a reminder to yourself of why you’re working in the first place. [00:09:34] Are you working because you’re in a position where you’re developing yourself in skills and you’re planning for this to lead to something bigger and better for yourself down the road? Are you working to pay the bills for your family? Have you been working in the same job for a long time and you really love your co-workers, and you know maybe one of them is sick and out, and you’re pulling the load on behalf of the team? Now, you remind yourself of why you’re working, and that can help you get through some really hard times. And so I think in a very fundamental level, understanding why you work in the first place is really important to explore. [00:10:12] When I was talking about Simon Sinek, just sort of like the CliffNotes version is Simon Sinek sort of thought through this thing called the golden circle, and his idea is, “Well, hey, maybe you know what you do, you may know how you do your job, but almost no one is thinking about why they’re doing their job in the first place.” And then I think, really, like a second helpful thing to think about, and it’s a little bit different than why, is, “What are the work activities you’re doing?” One thing on their calendar during the day that they actually really enjoy doing. And I like to talk about that as soul-filling work. [00:10:46] So that’s the work that you invest yourself in, and after you invest your energy and focus on that, you actually receive that back, so it’s sort of like a positive or return on investment. The more that your day is full of those kinds of activities, the better you’re going to feel after work, the more energy you’re going to have to work out, to cook, to be with your friends and family, to not conk out in front of the TV, to actually feel like you want to do something after work. And this sort of compounds and leads to positive results in your career, as well as for the organization, the boss, and the team that you work with every day. Lisa Cummings: [00:11:23] What a great visual. It makes me think of soul food. I’m thinking of okra right now. Ben Fanning: [00:11:30] Oh, yeah. Well, I live in Charleston so we really like the soul food concept. Ben Fanning: [00:12:22] You know, I’m totally with you on that, because I used to believe that. I’m like, “Man, I want to find my passion.” I know once I find out that I’m passionate about walking around in a Mickey Mouse suit around Disney World everything will be right. Lisa Cummings: [00:12:38] Are you going to dress up like a princess? Lisa Cummings: [00:12:45] You have to stand correct through the whole time. Ben Fanning: [00:12:47] At Disney World recently, those people as princesses seem to be very passionate about their work standing around. If you don’t even want to go through that, pull out your calendar for the next two days, and just put a red circle around the ones you’re looking forward to, as simple as that. Just put it on the ones that you’re looking forward to, because that’s a clue of something that maybe you could be passionate about. Maybe if you have more of that work in your job to look forward to you’d be more excited to get to work. [00:13:15] So that sort of clueing you into that important self-awareness, and then once you thought about why you got these motivating work activities identified, then you can start to assemble your personal game plan, or playbook, from moving more in that direction and taking action. Lisa Cummings: [00:13:32] What a great technique for paying attention to the things you’re looking forward to on your calendar, and rather than just doing them, like you usually would, actually thinking about how you can shape your job with those responsibilities. I talk a lot about this in my StrengthsFinder training, as well. It’s part of paying attention to what fuels you so you can get more of it. Ben Fanning: [00:13:53] I like it. I like it. It is the best investment of time. Most research, self-assessments, I try to be a little bit careful because sometimes people can sort of over-rely on them, just like looking at their work activities, that’s just sort of practical. But I think you can be such a great kick-start for like where to look. And if you’ve already put some of these pieces together, it can be a real validating thing. Lisa Cummings: [00:14:44] Ben, you are cracking me up. Okay, guys, you’re probably listening, thinking, “Wow, this guy really likes his Disney metaphors.” So now I’ll let you in on our inside joke, and tell you why he’s using Pooh Bear to demonstrate who you should partner up with at work to tap into your complementary talents. See, Ben recently went on vacation at Disney and I challenged him to work a Disney character into the interview without it feeling too off the wall, so that’s why he found his passion in dressing up as a Disney princess and teaming up with Tigger because their talents were complementary. [00:15:20] So even though you heard our silliness here, this is an important place where everything comes together. Ben started with that Simon Sinek concept where you identify your “why,” then you do things like his super practical calendar exercise to consider “what” activities energize you at work, then you use StrengthsFinder to dig into the “how.” It shows you how you think, how you execute, how you relate to people. So combine all of those and you’re tapping into a seriously powerful start to creating, or reshaping, the job you’re already in today. Ben Fanning: [00:15:51] Yes, I love that. That’s a cool combination. Lisa Cummings: 00:15:54] Now, what if you’ve been locking yourself into other people’s molds for a lot of years, and you don’t even know what it feels like to design your career for yourself? What if you’re executing on old belief patterns that will take you back into a rut and you don’t even know it? Ben Fanning: [00:16:12] Yeah, a really simple way to do that is stop advertising your accomplishments, doing the work that you don’t like to do, or the draining work. Ben Fanning: [00:16:22] It’s funny, I have a friend that’s an accountant and he was bragging that he got notified by LinkedIn, he’s like, “I’m in the top 5% of viewed profiles on LinkedIn.” “Okay, well, cool. Well, congratulations on that.” But I knew he doesn’t really like being an accountant. Ben Fanning: [00:16:43] And so I’m like, “You realize all these people are coming to your LinkedIn profile because they’re searching for accounting people.” And I’m like, “You don’t sound like you’re really happy doing traditional accounting work.” He’s since made some changes, but I think we all can fall into this trap so easily. People are sharing at staff meetings, or wherever, all these accomplishments on stuff they don’t enjoy doing. And what ends up happening is it’s like you’re a burnout work magnet, and I was like this for a long time. [00:17:15] One of my specialties early on in my career was managing this customs compliance team, and I was doing some logistics and supply chain work, and that group just sort of fell under the group I was managing. I was just amazed at the amount of work that that would attract. And the more results we had, the more work we had to do in that, and it wasn’t really helping my workday very much. [00:17:39] So I really thought through again the work that I was advertising that I enjoyed, and started to share some of those wins. The first step is to start to minimize that, and the first is – for everybody listening to day – to think about these few work activities that you enjoy and then start highlighting them, whether it’s your resume, your LinkedIn profile, or whether that’s in your weekly staff meeting, start to share it. [00:18:05] And, for me, years later, I discovered that one of the soul-filling activities for me was around presenting and training and mentoring other people, and that was not part of my job. It was a small facet but not a very big part, and certainly not mentorship. But what I did was, I started doing some mentoring of employees and then I would ask them to send a quick email to me and say, “Hey, that was helpful,” or, “Thank you for your insights on that.” And that teed up an excellent email that I would share with my boss. Lisa Cummings: [00:18:38] Oh, very clever, Ben. Ben Fanning: [00:18:40] Like, “Hey, here’s third-party validation that this other work that I’m doing that’s not really part of my every day job description is adding value.” And the next year I was able to get mentoring added on my annual review, so that was something I actually got evaluated for and so it became part of my job, and then I applied a very similar thing. And this is sort of expanding, but I’ll roll with it here. [00:19:11] So there was a situation where I was presenting and enjoying this stuff, but I didn’t really know what to do with it other than just presenting at my weekly staff meeting. So what I did was I listened to the problems that our group was struggling with which was getting closure on projects. These projects our group was involved in, they were stretching out way past the deadline and costing everybody money and getting the boss really ticked off. [00:19:36] And so I said, “Hey, what if I do a little lunch-and-learn training program around getting closure on big projects? Just like, how do you finish that project that has been hanging out there forever?” And I thought my boss was going to kiss me, he was so excited. He’s like, “That sounds great.” And so, suddenly, it’s my job to present ideas that I’ve been thinking about to our group. And the beautiful part was after that he shared those four modules that I did with somebody else, and so I got to go present it to a different team. And, literally, it started just to take off from there. [00:20:15] The funny thing is I would say that was one of those big inflection points where it sort of steamrolled into, “Well, hey, I’m going to blog a little bit. I’m going to share that blog.” And fast-forward years later, I’ve got a number one bestselling book that involves a lot of these stories and strategies that all came out of that experience. [00:20:37] That is the sort of thing, I think, that can happen if you start really small, acknowledge what’s motivating you, start to highlight those accomplishments, and then have that attract more of the work. And, really, that’s what happened for me and a lot of my clients, it’s the more you advertise the stuff you like, it is like a magnet. You start to get more of that work in your workday and you can sort of watch the evolution and build more momentum in that direction for your career. Lisa Cummings: [00:21:06] Oh, yeah. This is so practical. And it’s going to be a huge insight for people because it’s not just about finding things that energize you, it’s also about tying them to a business problem. If you can solve something that’s causing someone’s pain and enjoy the work at the same time, you’re going to get that kind of work thrown at you. No wonder your boss wanted to kiss you, Ben. [00:21:28] So, now, okay, flip it around. Here’s a dark side of that, I think, people might worry about when they’re listening. Do you think there’s a risk that you can get so much more work thrown at you, even if it’s good work, that you end up working an extra 10 hours a week, and kind of kill the upside of it all by piling on more and more? Ben Fanning: [00:21:51] Yeah, and I think it’s so important, like you said, people could say, “Well, I don’t want to do more work,” or, “That’s too much.” If it feels like too much, I mean, in my opinion, is not to do it, because that’s going to come across to whoever you’re working with on this, and it’s going to come across as a have-to-do versus a get-to-do. So carve out a really small action or small lunch-and-learn, 30 minutes, on a topic that’s useful to the company, and the team, but that you actually want to do. [00:22:20] Good grief, if you don’t want to do it they’re going to know. And it works in other ways too. I thought of the lunch-and-learn because that’s a really personal example but if that’s not your bag then let’s think of something else. Maybe you like doing financial analysis and you really are passionate about that. You can offer to show somebody how to do an analysis, or do it for someone. Or maybe you like to automate tasks in Excel. If that’s you then, first, please call me. I like that. [00:22:51] But you can just start with what you like to do and what’s interest to you and start to sort of bring that into work in some capacity and just watch what happens. Watch the magic. Lisa Cummings: [00:23:04] Ha-ha, watch the Disney magic. And, okay, as you’re creating these new responsibilities in your job, as long as you’re solving a business problem, you can negotiate it so that as you add two or three new responsibilities that solve a big business problem you’re also deleting other ones. That way people won’t feel like it’s becoming an out-of-control workload. Ben Fanning: [00:23:29] Yeah, and you can go deep. I love thinking about how these things can help the organization, and because that’s really an important thing, I think a lot of employees when they think about this stuff, they’re thinking about “me,” right? They’re not thinking about the organization, and so the art and the real trick is to make sure it is impacting the organization, because that’s how you can even go further with your career and your job and the benefit to the company. There’s really always a way to tie it back in some positive form. Lisa Cummings: [00:23:59] All right, everyone, you heard it here. Now it’s your turn to go solve a problem that lives in your strengths zone. So go find some soul-filling work like this Southern have been, who got fired from his therapist in Manhattan because his work was sucking his soul away, and he turned all that situation into something great. If he can do it, you can do it. Lisa Cummings: [00:24:23] So when they want more of you, obviously, they’ll read your book The Quit Alternative. Also, tell them how to get more Ben Fanning in their lives. Ben Fanning: [00:24:33] You guys go on over to BenFanning.com, and right now you can go over there, I have a report, it’s called The Catastrophic Cost of Quitting. Don’t fire another employee or resign your job until you’ve reviewed this report. Basically, it’s a really quick review on the cost of quitting. If you’re thinking about quitting your job, it breaks down the cost, it actually shows you how the uncovered costs for them can equal more than the cost of a new car. [00:25:02] So it’s not that you shouldn’t think about quitting ever but if you’re ever going to do it make sure you take the same calculated risk and go to this calculations like you would with a big financial investment, and from a company side, decreasing disengagement. Disengaged employees are two and half times more likely to quit, and you look at a 10,000-person organization, you could buy a couple of Super Bowl commercials if you could have other impacting engagements. So think about that. This reports walks you through that over at BenFanning.com, and I invite you to get it and enjoy. Lisa Cummings: [00:25:38] Enjoy, you guys. Go grab it. You’ll love reading Ben’s work. It’s such good perspective. It’s not about quitting the job, it’s about taking accountability for your career and creating one you love. So get on out there, go claim your strengths, and share them with the world.